Talk about fifty shades of gray. For much of the year, the entirety of the Sonoran Desert is more or less some variant on gray or brown. In spring, however, the desert landscape bursts into color with the awakening of the flowers. My parents and I decided to take advantage of the spring weather and hike one of Phoenix’s big mountains. Phoenix is unique in many ways, but one of the things I love most about this city is the mountain ranges that rise from the center of the metropolis. In fact, Phoenix has the best urban hiking in the entire United States. We decided to hike Piestewa Peak, the second tallest mountain in the Phoenix Mountain Range. Piestewa used to be called Squaw Peak, but many people felt that this name was not respectful. It was renamed to honor a Native woman who died in combat in Iraq. Piestewa Peak stands at 2,612 feet in elevation. Its prominence is 1,175 feet. We made it up in 36 minutes. At the top we enjoyed the sweeping views of the Phoenix area. No ocean anywhere… just miles and miles of dust and hills. What a difference from the view from Pic Paradis back home! I do have to say that I love both the watery disk of Caribbean mountain top views and the endless layers of mountains in the Southwest. We could even see Arizona Christian University (my alma mater), Ben’s and my first apartment, and the Cardinals stadium from the peak. We met a small, furry resident at the top of the mountain. I don’t see many squirrels in the Valley of the Sun! He’s so cute. Later, at the bottom, we saw the squirrel’s smaller cousin: a chipmunk. The top of the mountains are a butterfly’s paradise. Each spring, they flit and flutter at the peaks, away from the oppression of dust and pollution. At this time of year, the cactus begin to bloom. My mom says that cactus blossoms are God’s grace on an ugly plant. They certainly do add beauty to something you’d rather not hug. Still, cactus are interesting and have their own kind of charm, whether they’re blooming or not. Desert wildflowers are gorgeous. 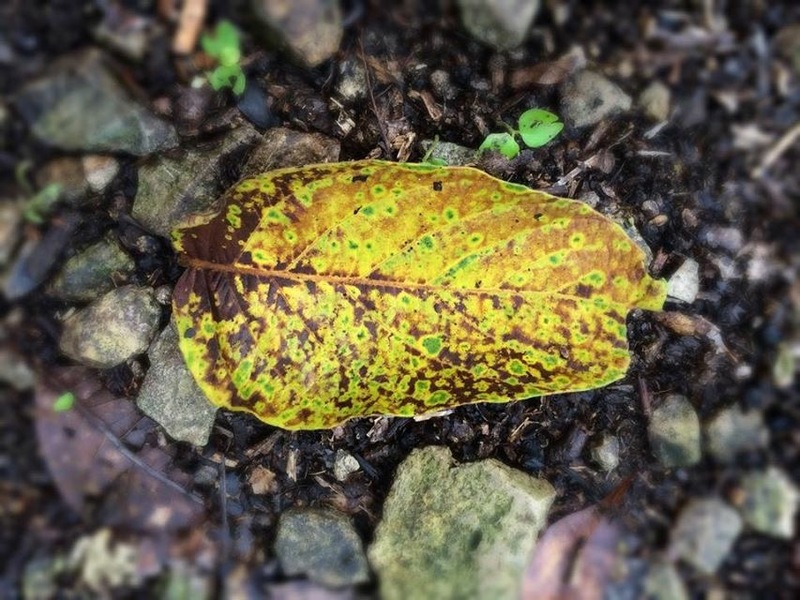 Some years, they barely show up. 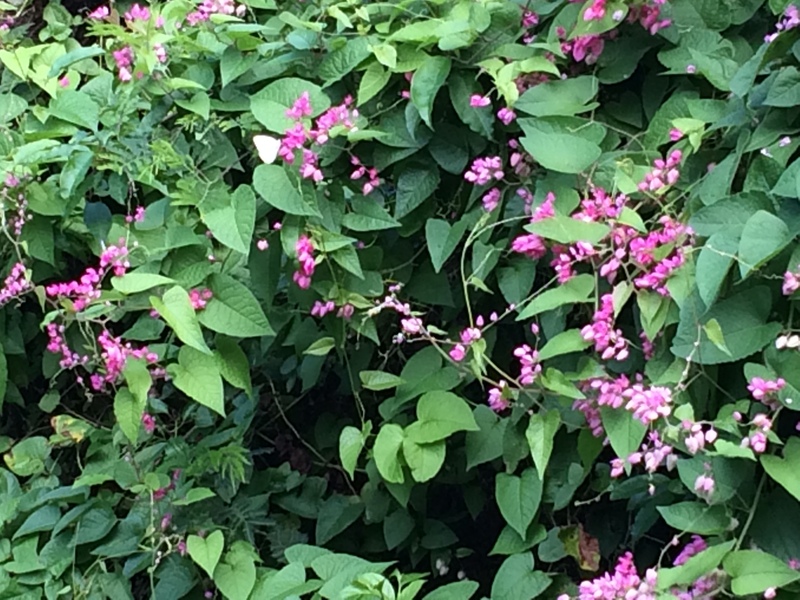 Others, they carpet the hillsides in vibrant pinks and yellows. They are at the mercy of the droughts. The quiet stillness of the hills are a refreshing break from the hurry and busyness of city life. I think that’s how we all keep our sanity. A hike to the top of the mountain puts everything in perspective. What’s the worst thing about an island community? 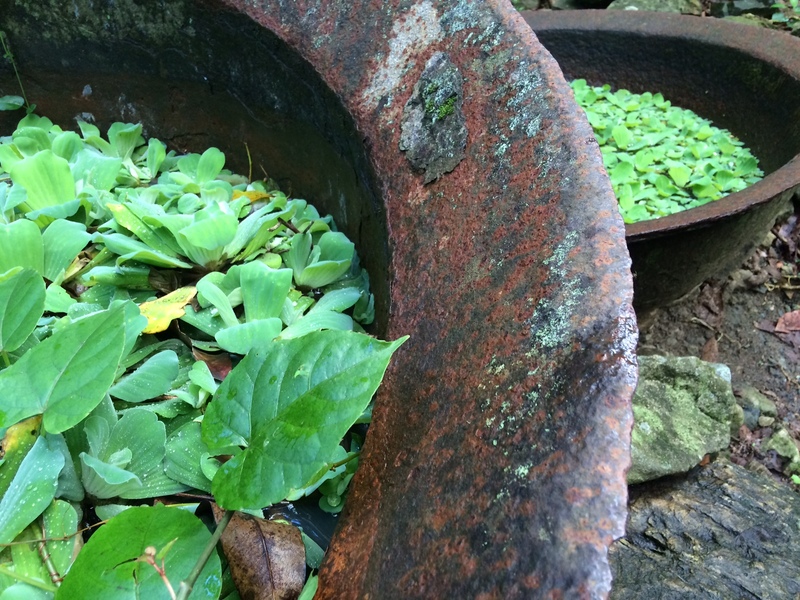 The eco-conscious among us would likely say sustainability problems. Image it: we have over 75,000 people on a 37 square-mile rock in the middle of the ocean. Where is all that nasty groundwater run-off going to go? Where is all the trash going to land? 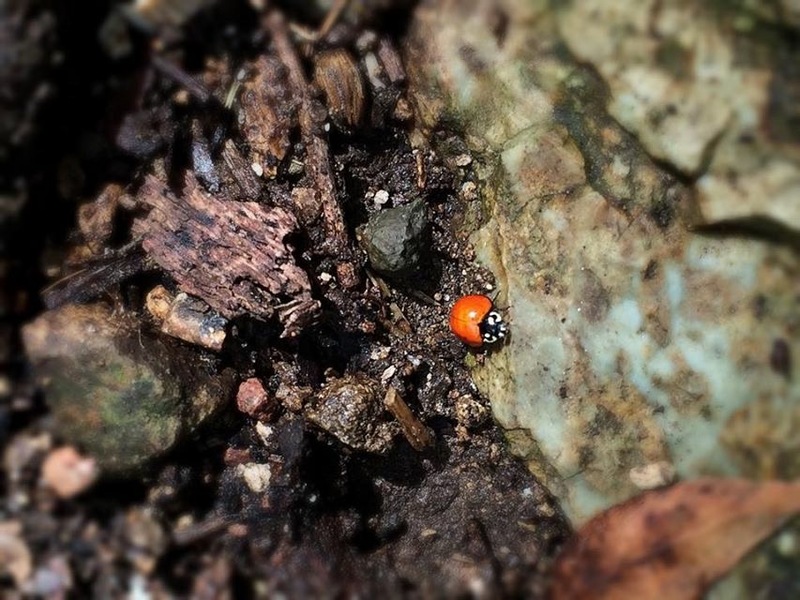 Now, before you check out of what you think is going to be yet another Greenpeace-style soapbox rant, consider the delicacy of our microscopic ecosystem and the impact that you can make on it. Even if you don’t live in the Caribbean, you may want to visit some day for a vacation (Do it! It’s beautiful here). 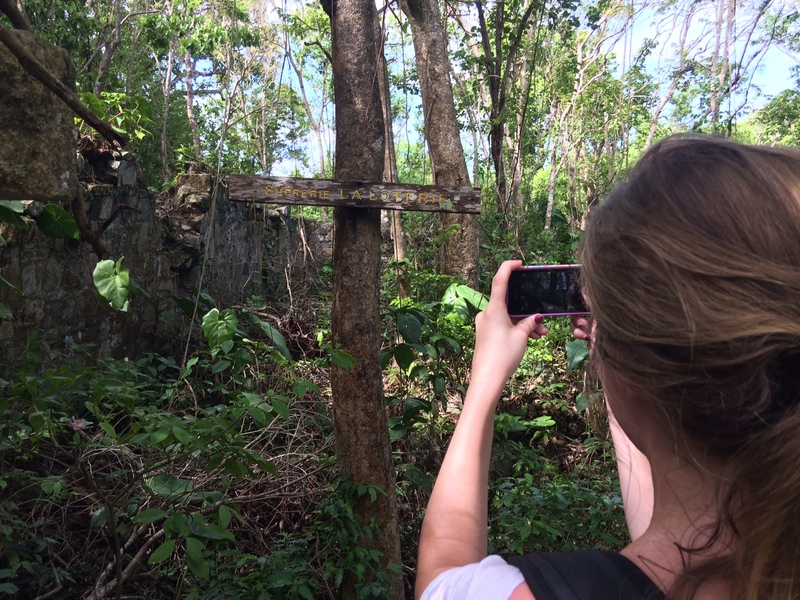 You may be surprised to find out that visitors have a gigantic impact on the appearance of sustainability of the island. How? Find out in the article I authored for Seven Seas Magazine. 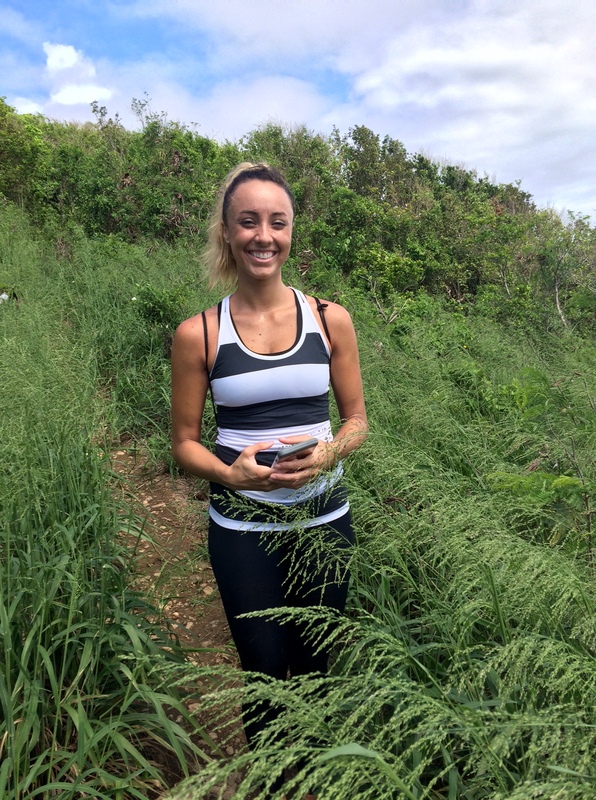 The article’s title is “The Other Side of the Island” and it is on page 30. Let me know what you think! Do you have any other ideas for how tourists can contribute to a healthy ecosystem? Technically, it’s not a rainforest. Technically, it is considered highlands. This is what I remember from my natural geography class in college. Whatever the botanists call it, it still looks and feels a lot like a rainforest! There are even rumors of monkeys high in hills. We didn’t see any on our hike, but we did see a lot of butterflies and many points of interest! 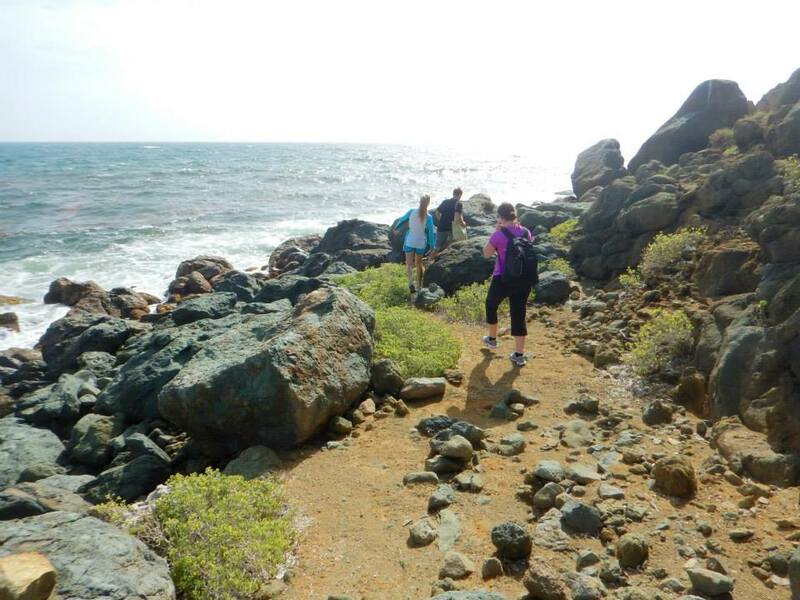 Come join us on our hike to Pic Paradise at Loterie Farm on the isle of Saint-Martin. 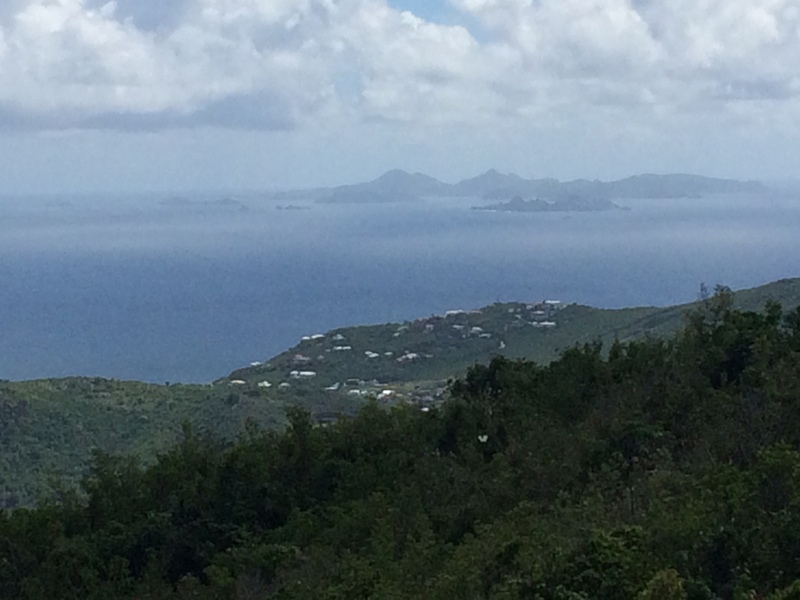 You can see three countries from here: Netherlands (Sint Maarten) on the left, France (Saint-Martin) in the middle, and England (Anguilla), the long island on the right. 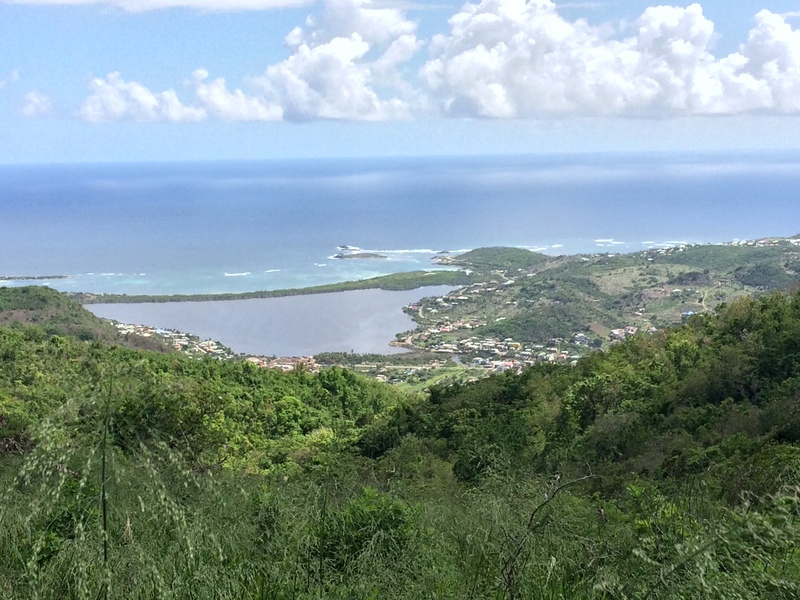 Loterie Farm is east of Marigot on the French side of Saint Marten. It is definitely a place you should go when visiting the island. 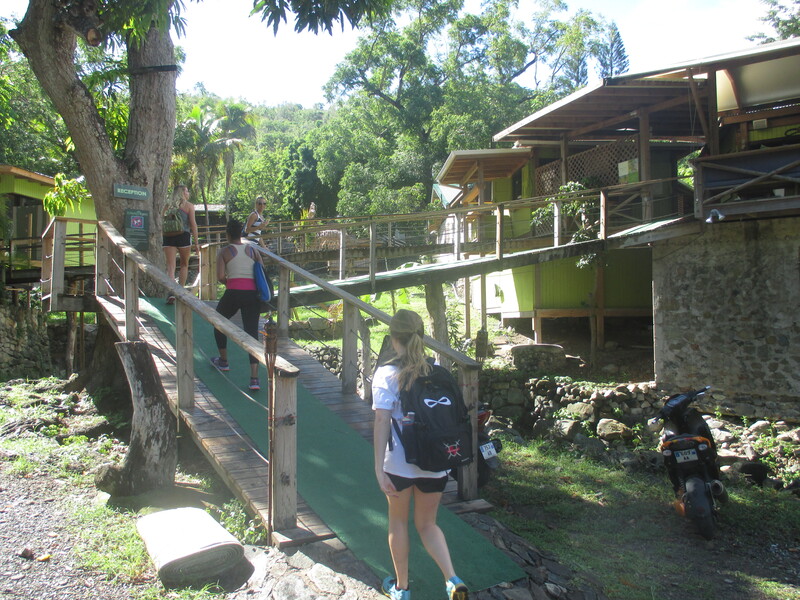 It has a pool, a crazy zipline, dining, and (of course) hiking trails. 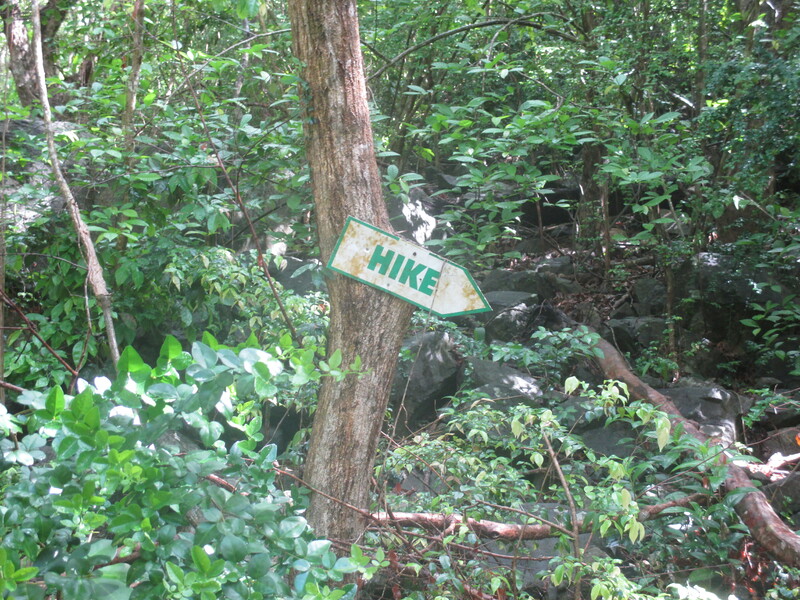 The cost of hiking is five dollars or five euros. The money is more than worth it, I promise. I and my friends decided to take the long hike with the scenic view at the top. It took a couple hours to complete, but we were glad we did it! This hike is now on my list of favorite hikes, up there with the glacial lake in Red River Valley, Badlands, and Kenya’s Great African Rift. 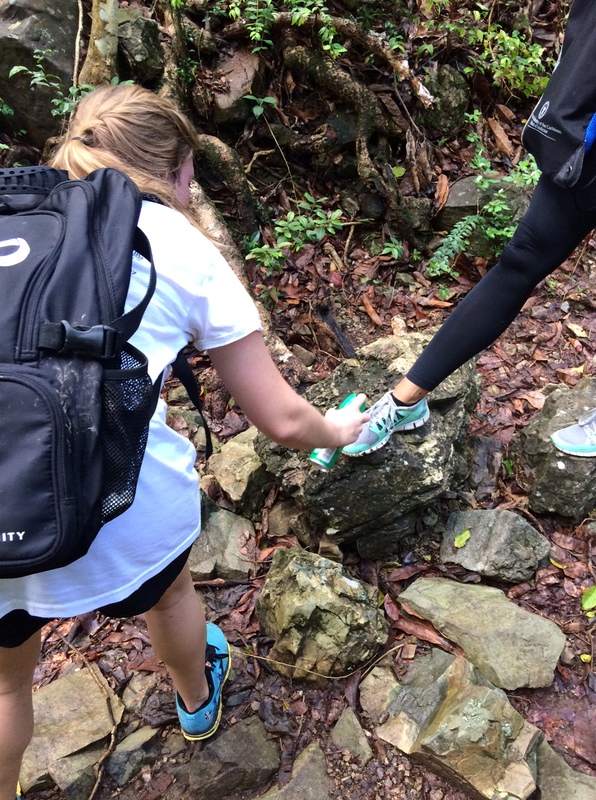 We grabbed hiking sticks, consulted our map, and hit the trail. 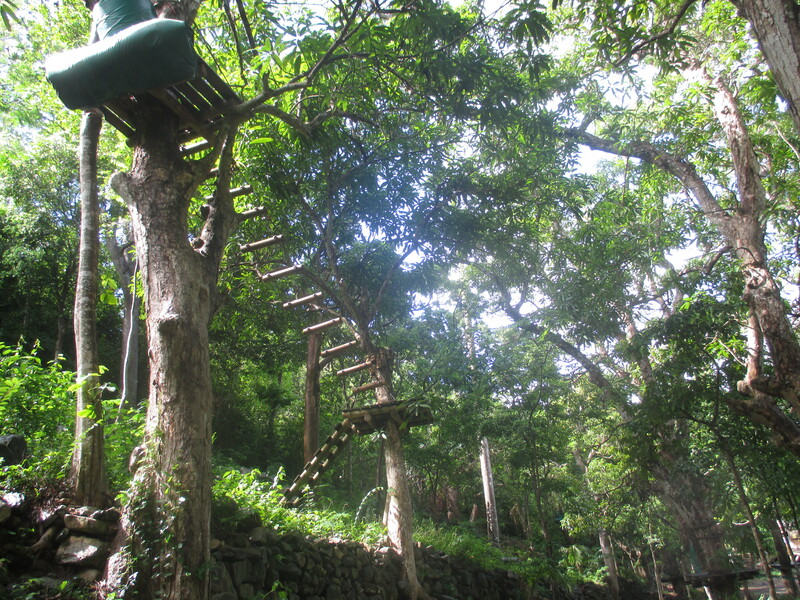 The first thing that we noticed were the obstacle courses and zip-lines in the trees above us. 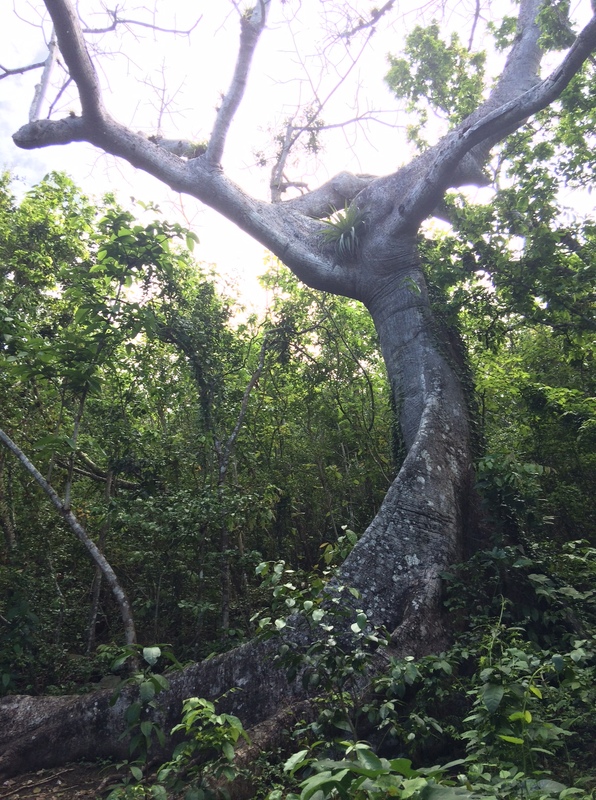 I felt like I was walking in Tarzan’s tree house! There are several points of interest on the map. 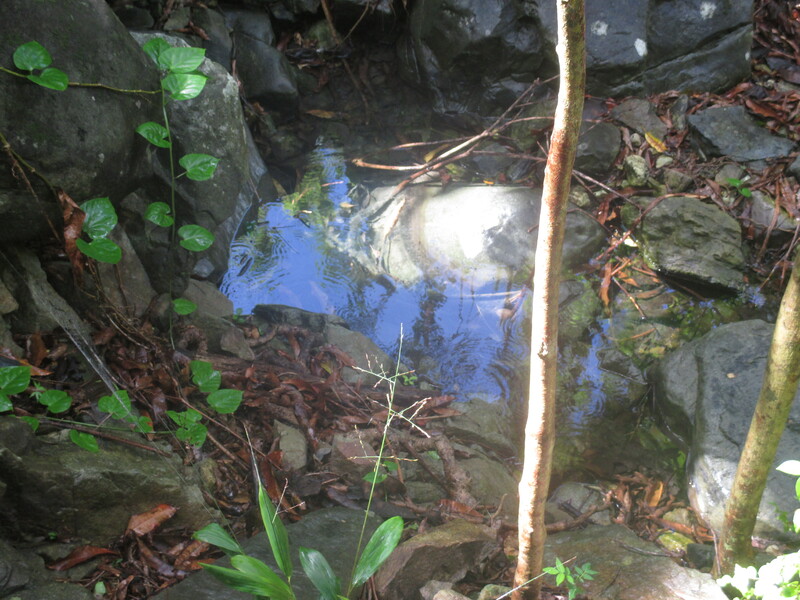 The first one we came to was the natural spring. 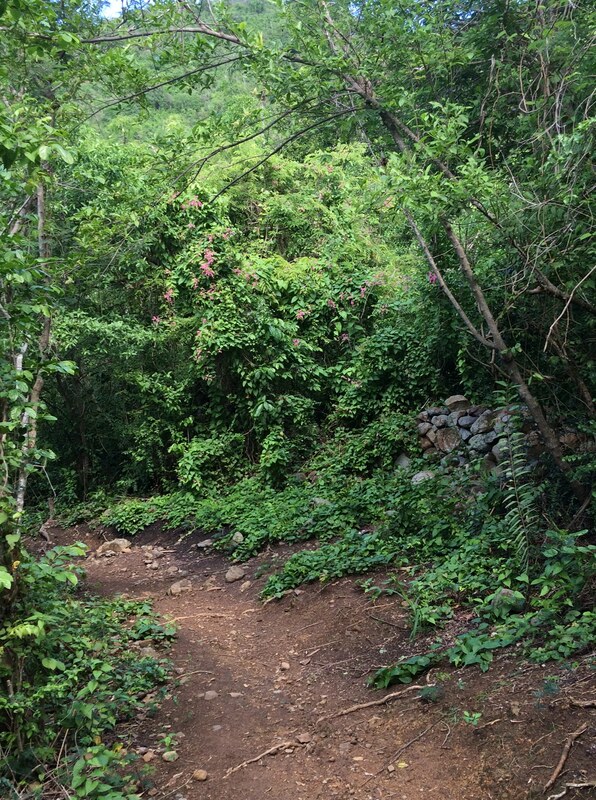 Once we arrived at the spring, the trail began to climb steeply uphill. It was a little slippery on the mossy rocks, but the climb was worth it once we made it to Chewbacca View Point. We could see for miles from the viewpoint! Of course, most of that was just ocean water. 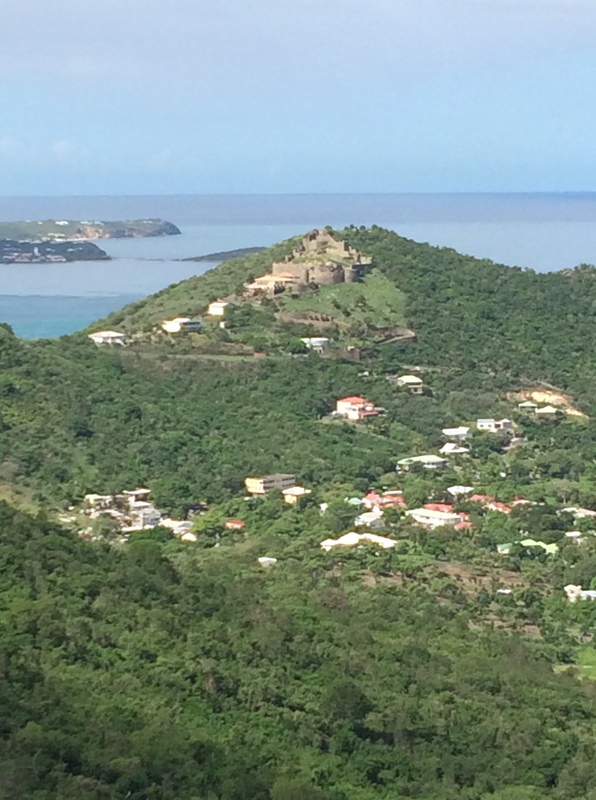 The view gave us perspective to see how small Saint Martin really is. But what a beautiful watery wilderness the Caribbean Sea is! We could see three different territories from our lookout point. We could also see the ruins of an old fort. 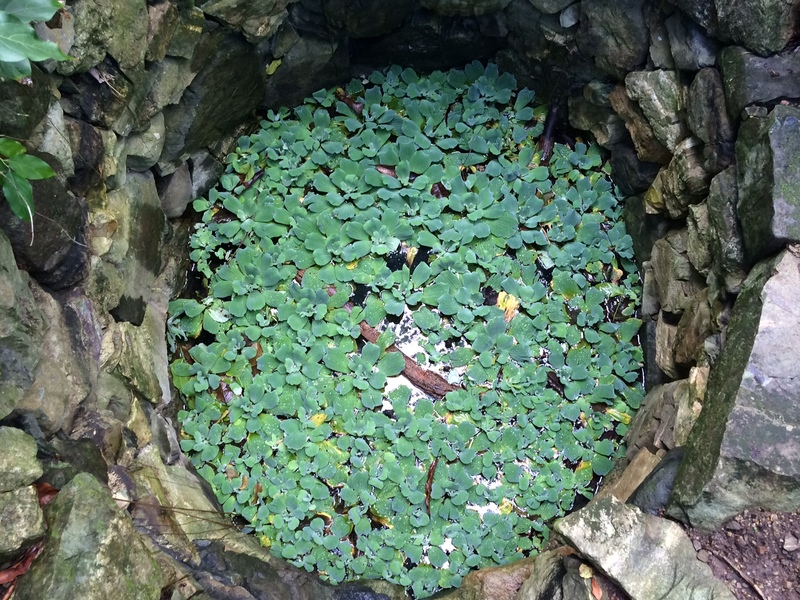 The next stop on our trek was the old well. By this time, we were all getting a little nervous about the ant armies that covered the trails. Stacey kept us safe by spraying our shoes with OFF. Fortunately, the bugs are our biggest problem. There are no snakes on Saint Martin. European colonists imported mongooses to catch and kill the snake population. Now we just have a mongoose problem. Beyond the well are ruins of the old sucrerie. 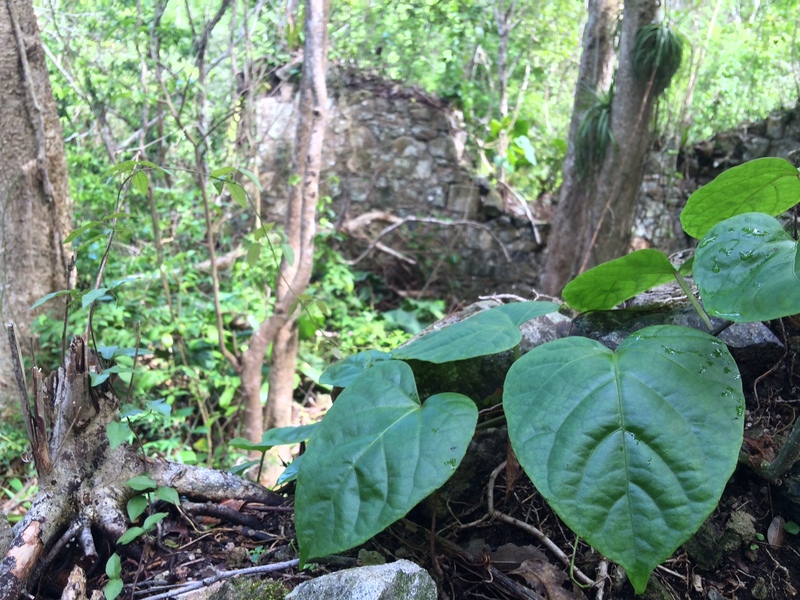 Ruins are my favorite hiking gems, so I was pretty thrilled to see them. And this odd statue of a double-jointed man in distress. 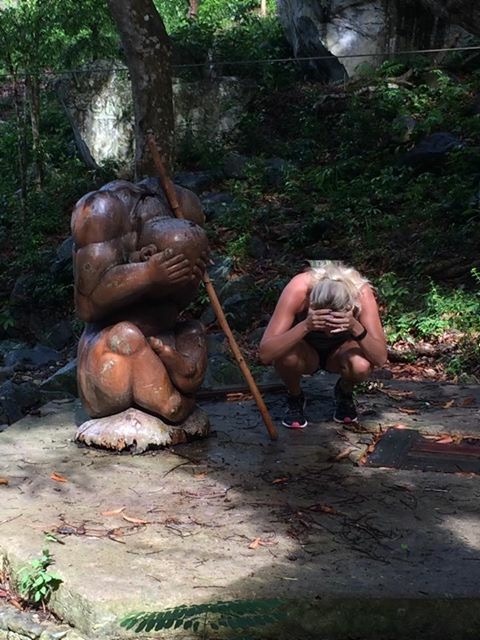 Naturally, Kayla decided to empathize with him. Social workers are very good at that. We finally reached the lookout point at the top of the mountain! You can even see some ghostly islands in the distance. I believe they belong to Saint Bart’s. I expected to see a pirate ship sail out of the mist at any second, but all we saw was a cheerful little sailboat. 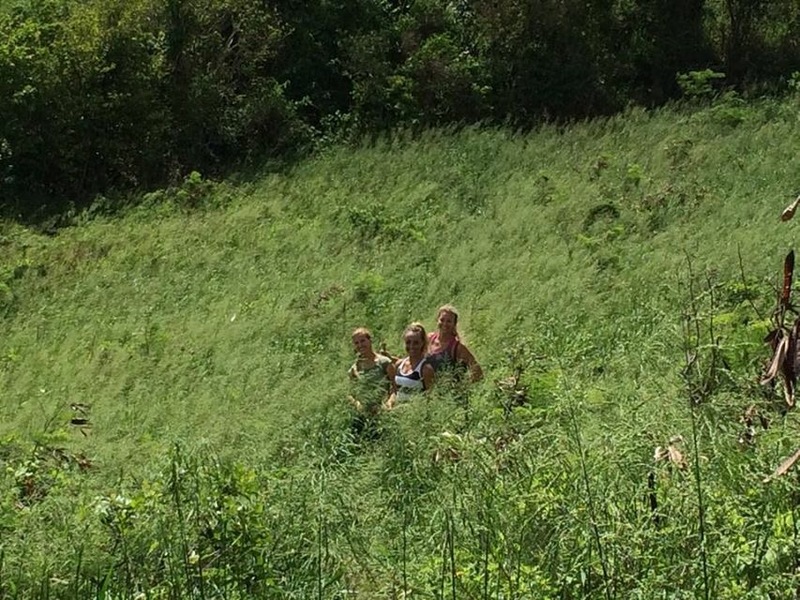 To get to the lookout, we had to walk down a narrow path through tall grass. It made some of us itchy, but it was nice to have a break from the tree cover and feel the ocean breeze. It was also a great place for taking photos. Kalie was kind enough to pose for me. The trail seemed to go out into the middle of nowhere, so we eventually turned around and headed back to the mapped trail. 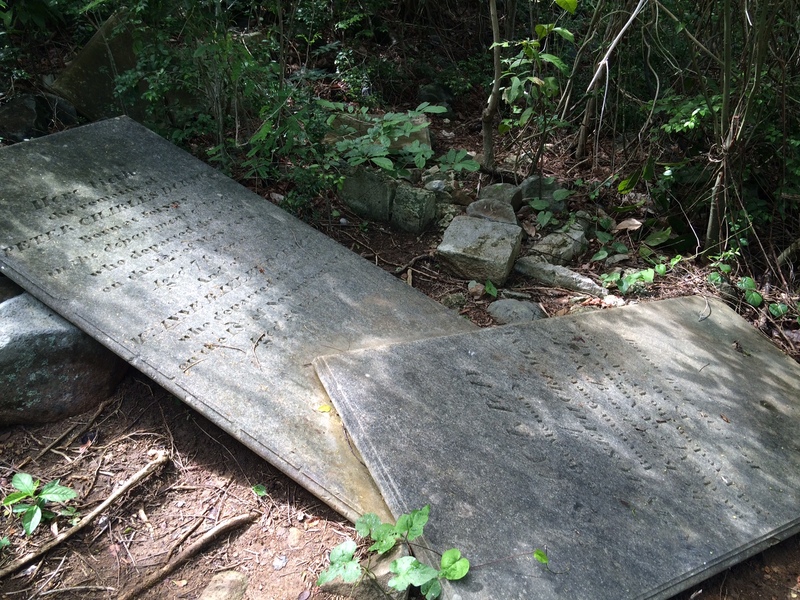 On our way back, we found something attention-grabbing that was not on the map–graves! Or at least gravestones. Some of them were broken, so we weren’t sure if they were even in the right place. They were about 150 years old. The entire hike, we were surrounded by clouds of butterflies. They’re hard to catch on camera, but I did my best! 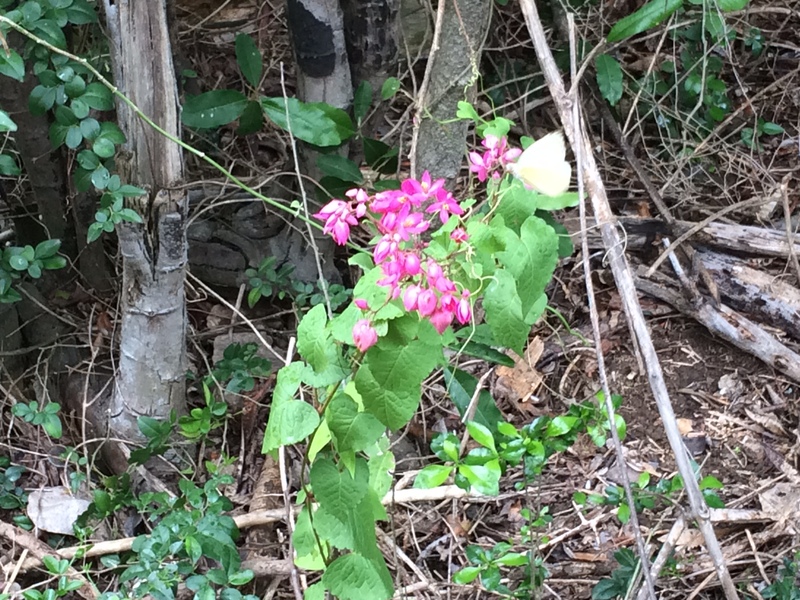 There were hundreds of white butterflies and the occasional yellow one or orange monarch. We arrived back at the base camp tired, sweaty, and dirty, but happy and refreshed! What a wonderful way to spend a sunny morning in the Caribbean. We will be back. 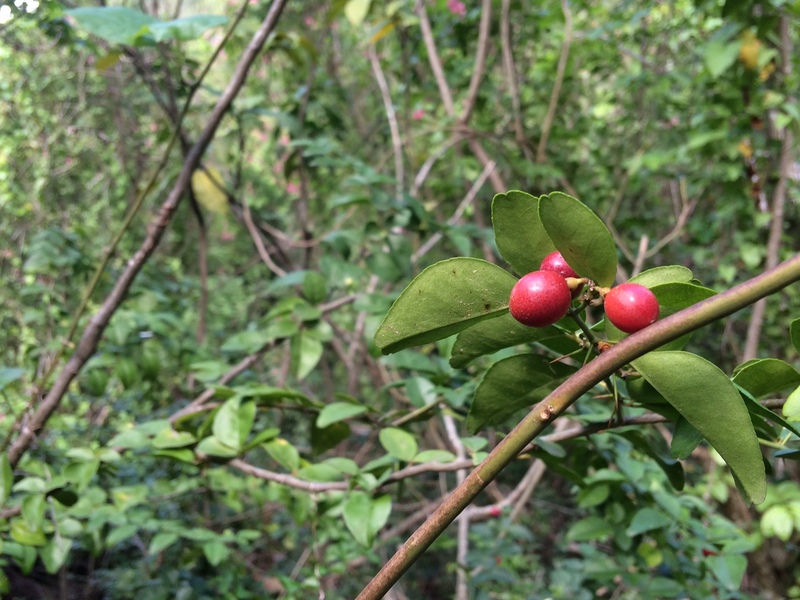 The Island of Sint Maarten is home to many exotic plants and animals. 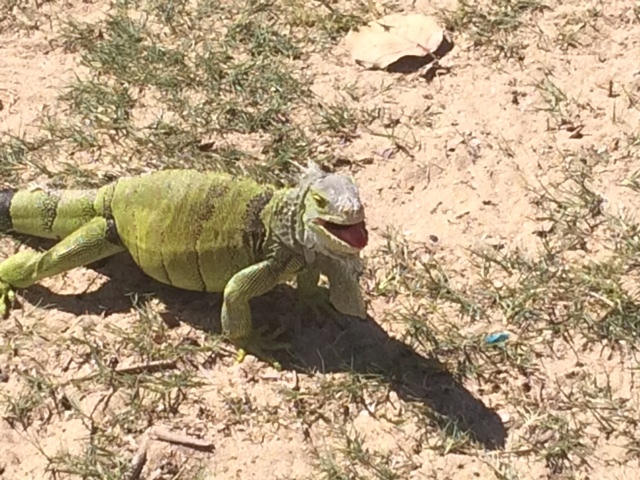 From the coconut palms, to the brilliant fish, to the dozens of lizard varieties, to the flowers, Sint Maarten/Saint Martin’s wildlife is one if its biggest tourist attractions. 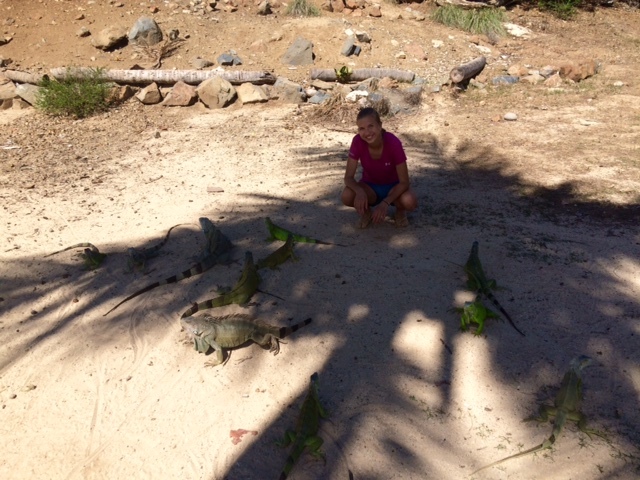 The iguanas are by far my favorite Sint Maarten land animal. 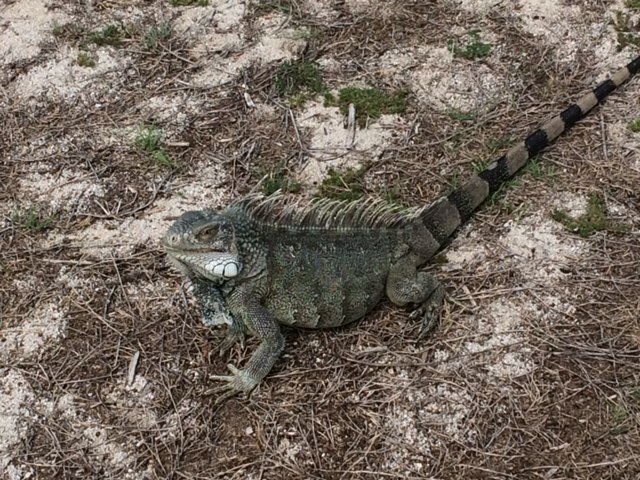 They are brilliantly colored, they are gigantic, and they let you get pretty close to them in some areas of the island. They also run comically and it’s entertaining to watch them scurry away and leap into the nearest body of water if they become frightened. I wish I could take one home to the U.S.as a pet when we leave! 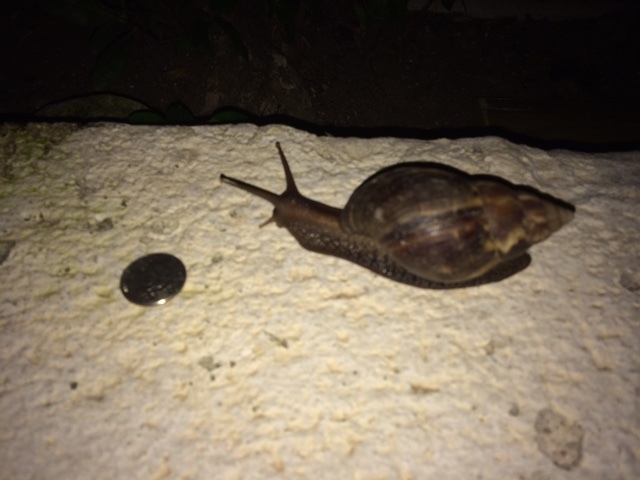 This snail was moseying around our apartment one night when I caught it on camera. I would have caught it in a different way if I had realized what it was. This is one of the Caribbean’s most viciously destructive invasive species: the giant African land snail. 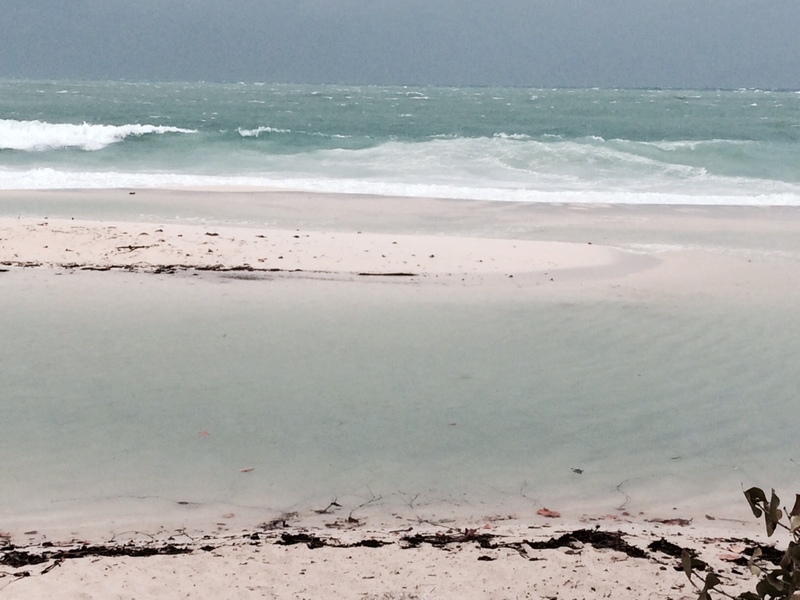 It is wreaking havoc on our islands and causing concern among environmentalists. Quite an impressive feat for such a slow-moving animal! Pardon the fuzzy image below. I think this is a mud crab. He was pretty skittish, so I couldn’t get as good a look at him as I would have liked. 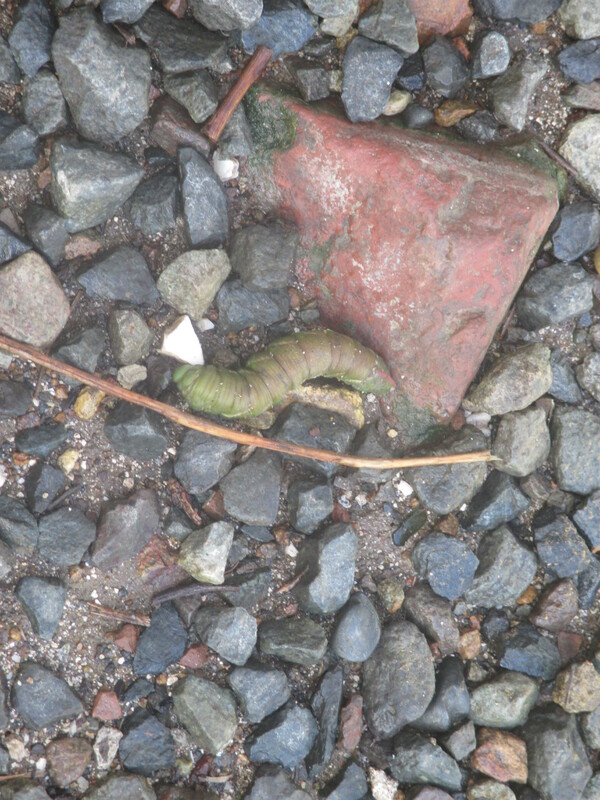 This critter’s body was a good six inches long! I found him on the driveway into a friend’s apartment complex. 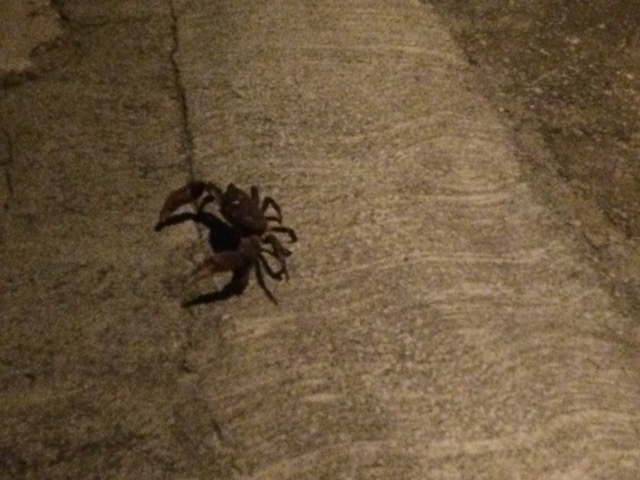 He was intimidating enough to cause uneasiness in one of the residents, who was hesitant to try to get past the crab on his way home. What I found on my front porch was a little more exciting and definitely less awesome. This centipede was about four inches long. I started screeching when I saw it, and it scurried away, trying to find refuge in our neighbor’s apartment. 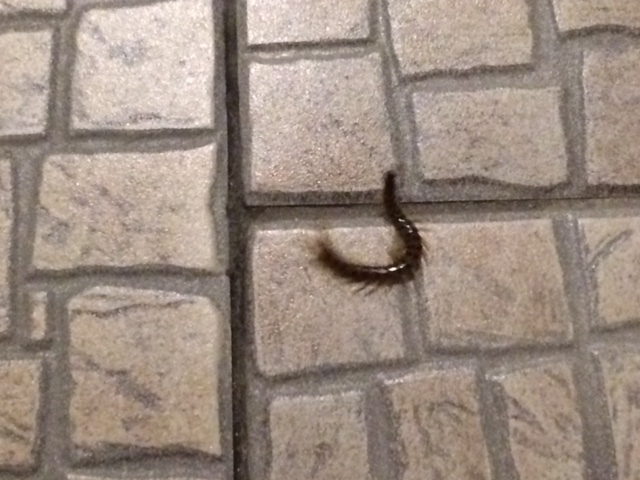 I wonder what our neighbor thought about the racket outside as I hollered at Ben to get the bleach and kill it, and then danced around shrieking when the dying centipede writhed and wiggled much too close to my feet! And yet I still thought it was worth it to get close enough to take a photo. As long as I am talking about land animals, I certainly cannot neglect to mention the cows. 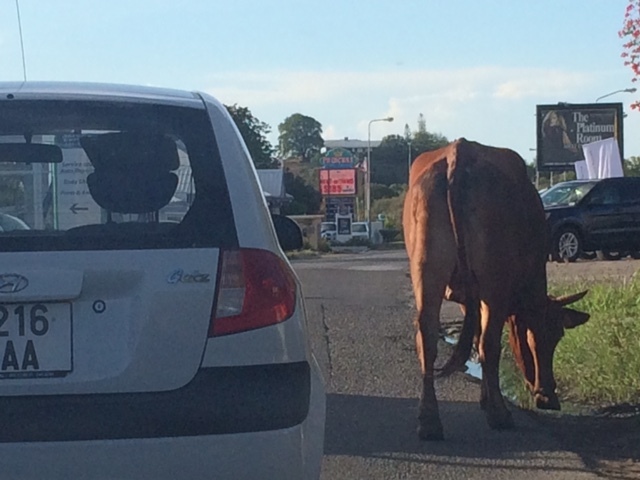 This cow blocked traffic for a few minutes on our way back from Philipsburg one day. We don’t have any cows on the western arm of the island, but up the hills there are quite a few of them. 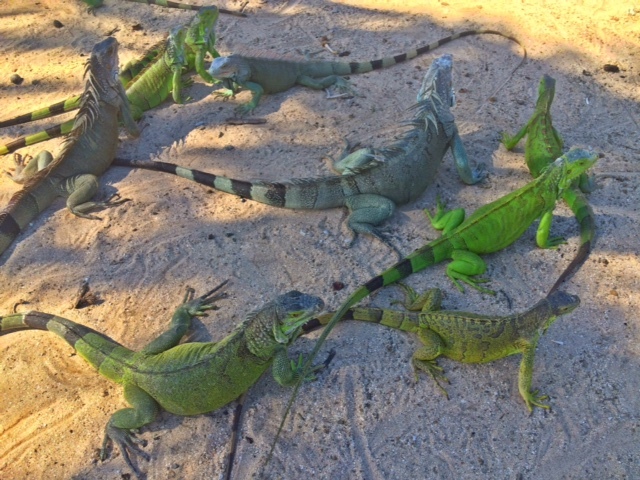 These are just a few of the animals living on the island of Sint Maarten. Hopefully, my camera and I will find some more animals to share with you later! 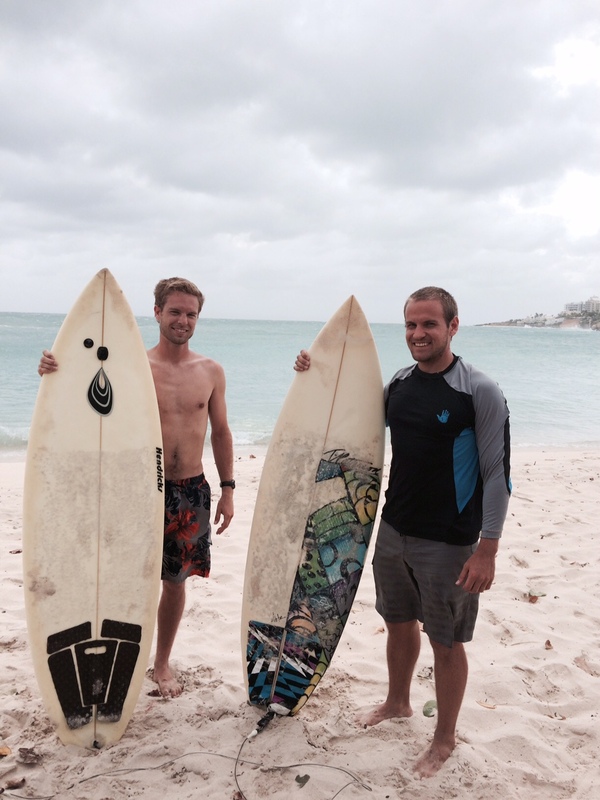 We have now been living in Sint Maarten for a week! 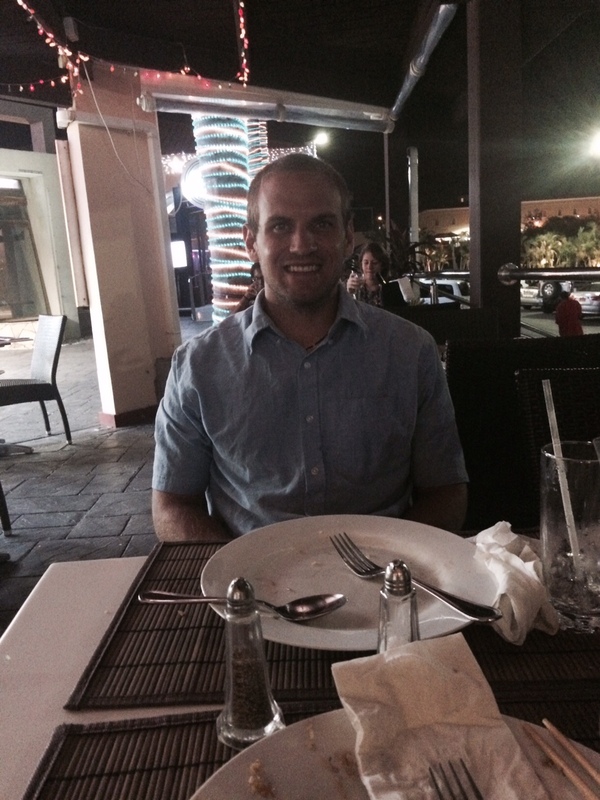 We have a week yet to explore and enjoy before classes begin for Ben at American University of the Caribbean. We’re going on as many adventures as we can on our beautiful island home. 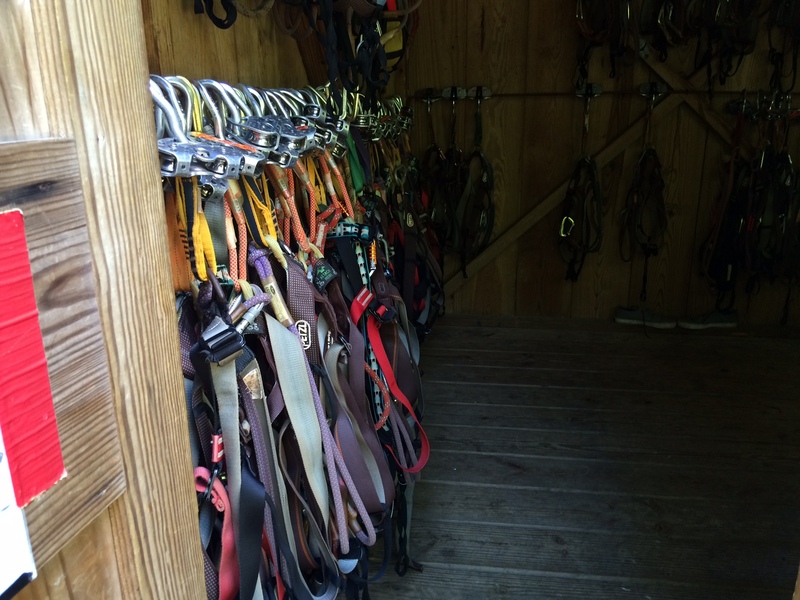 Here are some of the fun things we have done. 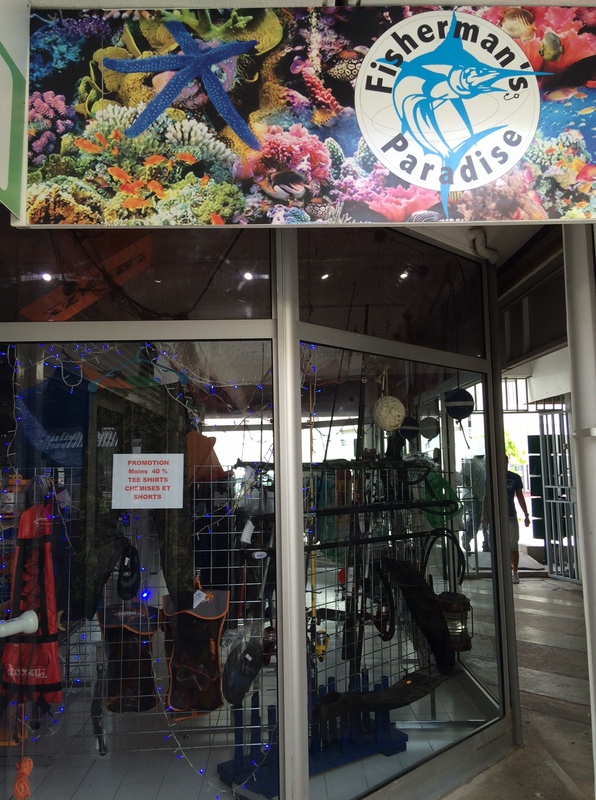 If you ever come to Sint Maarten, take some time to try a few of these! We love Mullet Bay Beach! I can’t believe we live just a short walk away. Mullet Bay has gorgeous fine white sand, warm clear water, and best of all, not too many people. There is even a little beach snack shack with umbrellas and chairs for rent. We took an excursion to the French side of the island last week. 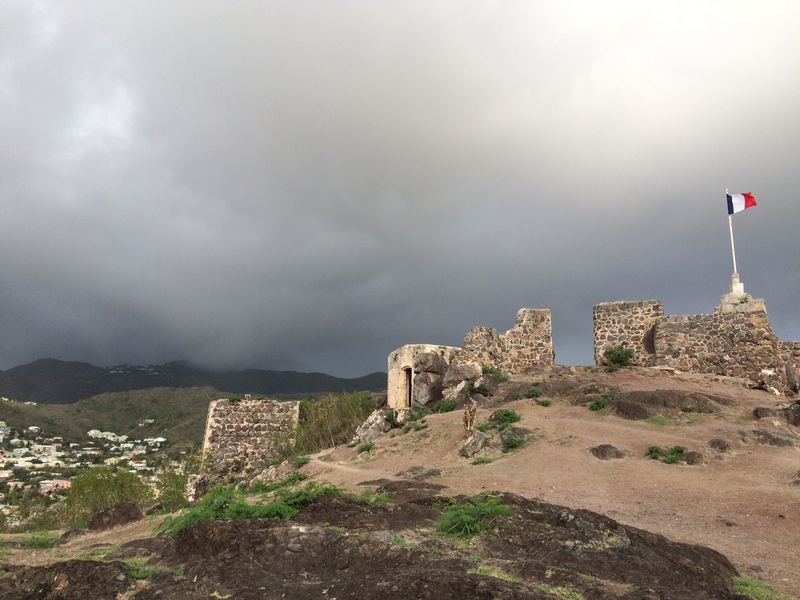 On the north side of the town of Marigot, there is a short hike to the ruins of an old French fort. I’m not sure if the best part is the view or the awesome vintage cannons. I’m not sure about the French side of the island, but on the Dutch side, one does not need a license to fish. And the fishing is good! We’ve done just about every type of fishing you can imagine. It’s fun, but the downside is that most fish aren’t edible. The majority potentially carry Ciguatera, an incredibly toxic virus that affects people quite badly. Fortunately, the little ones and the herbivores are generally clean. We made fish tacos last night. They were delicious. 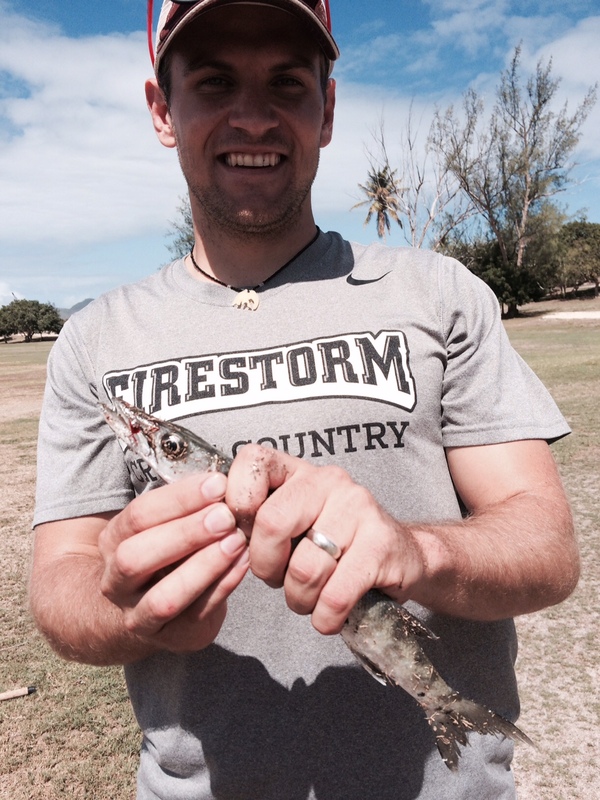 Ben catches a barracuda. Can’t eat these, unfortunately. Both the French side and the Dutch side have great shopping. Most of it is pretty expensive, but what do you expect on an island? Our shopping has been limited to fishing equipment and groceries for the most part. 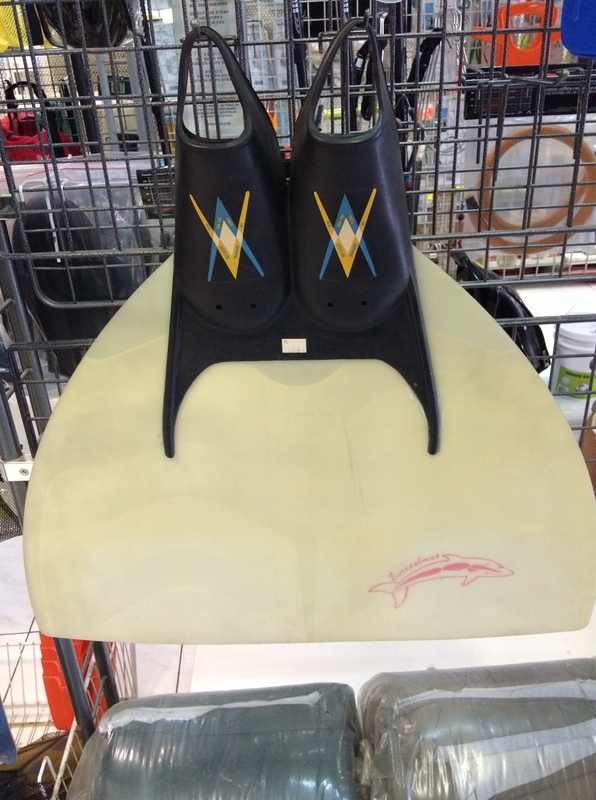 I’m not sure what exactly this is useful for, but I’ve always wanted to be a mermaid! The fish here are beautiful. There are few things more fascinating than watching tropical fish go about their little fish lives. The variety and color is amazing! So far, the coral we’ve seen is a bit drab, but the fish make up for it. The other day, I saw a scary huge barracuda and the biggest granddaddy spinefish I’ve ever seen! I wouldn’t recommend the gambling, and a definitely wouldn’t recommend the bars. I’ve heard of the sketchy and dangerous things that happen in some of these bars. However, the casinos sometimes have pretty great food for a reasonable price at their restaurants! We ate at Thai Savanh’ in Stars Casino for Ben’s birthday. They have a nice patio for dining away from the smoke of the casino. 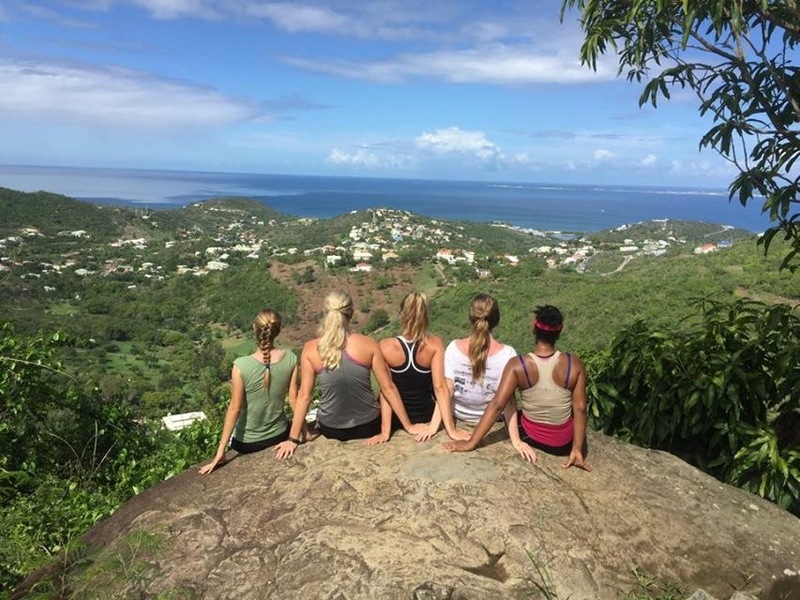 We went on Guana Bay hike with friends yesterday. We loved the views! There are so many little islands that you can see from this trail. 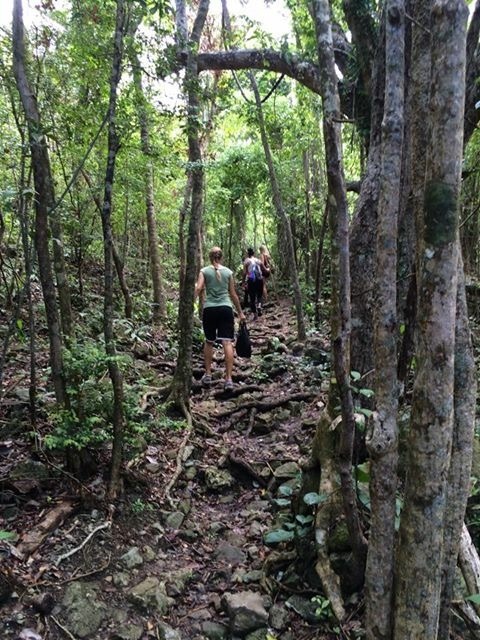 This is just one of many hikes on the island. There are good opportunities for running, too, whether on the beach or the golf course. The flora and fauna here is awesome! Ben climbs coconut palms so we can have fresh coconut milk. 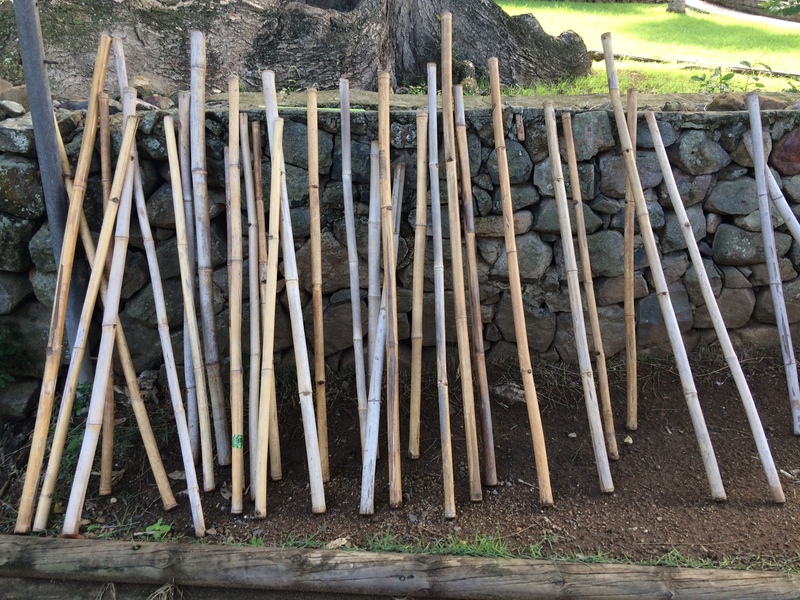 There are a few fruit trees here, too. 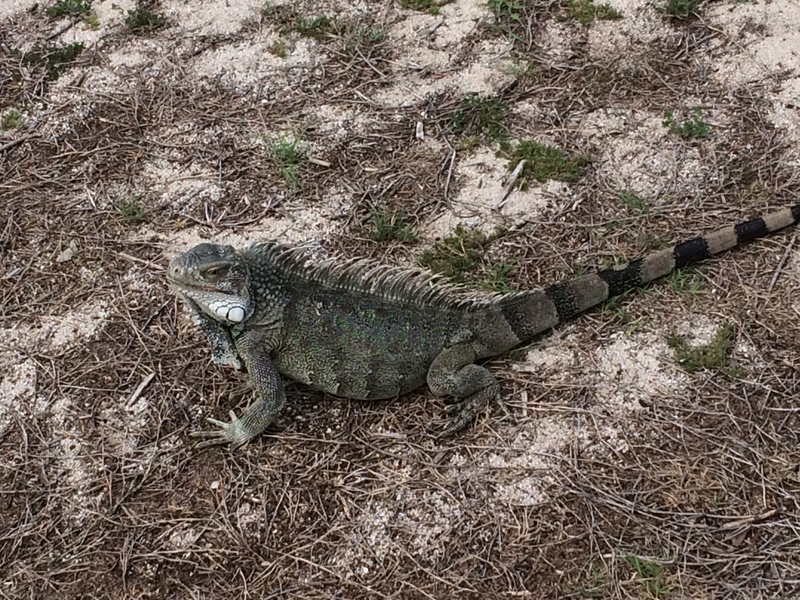 I’ve already mentioned the fish, and in addition to sea creatures, there are interesting land creatures, too, like the giant iguanas that sun themselves on the golf course.